It’s that time of year again—your heart races, your palms sweat and the past haunts you. No, it’s not tax season. It’s Halloween—the celebration of costumes, candy and scary, well, just about everything. Halloween is big business for the food processing industry, with this year’s U.S. confectionery sales expected to top $2.5 billion dollars. The food service industry also capitalizes on the holiday, often holding special promotions celebrating the time of year. However, Halloween is essentially year-round for some restaurants, with ghost sightings and paranormal activity always a daily special. 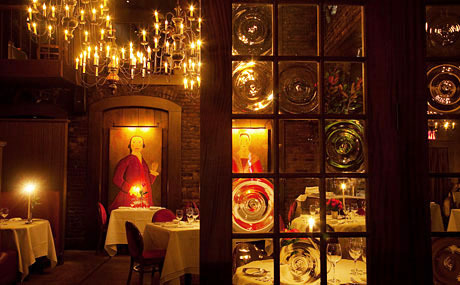 Arnaud’s, New Orleans, LA: One of the most haunted places in one of the most haunted cities in the world, Arnaud’s is haunted by its founder, “Count” Arnaud Cazenave. His ghost occasionally appears in the dining room, seating “guests” who then disappear through walls. Beardslee Castle, Little Falls, NY: Featured on the TV show “Ghost Hunters”, the two resident ghosts have been known to shatter glasses, close doors, reset tables and move objects. Bodega Brew Pub, La Crosse, WI: This pub’s original owner died on the premises in 1901. His ghost has been seen by patrons and employees, occasionally tapping their shoulders. Unexplained chills have also been felt, and bricks stack and restack themselves in the basement. Casey Moore’s Oyster House, Tempe, AZ: Patrons have reported seeing ghostly couples dancing in the upstairs room, as well as flatware flying through the dining room. An eerie glow often radiates from the second floor. Catfish Plantation, Waxahachie, TX: Known as the “most haunted restaurant in Texas”, this Cajun restaurant occupies the former home of a deceased woman. Coffee brews itself, dishes and cups have been stacked in odd places and a ghostly “bride” has been seen by the windows. Ear Inn, New York, NY: Built in 1817, the building has been a bar and restaurant over most of its life. Spirits who died during Prohibition, when the Ear Inn was a speakeasy, are said to still frequent the bar. The fireplace often ignites by itself, and cell phones die for no reason. Hooters, Chicago, IL: Housed in a building that served as a morgue to the victims of the 1915 Eastland disaster on the Chicago River, the downtown Hooters is also near the site of a 19th Century bodysnatching operation. According to staff, there have been many strange sights, sounds and other paranormal activity in the restaurant. The Jury Room, Columbus, OH: Opened in 1831 and built on a Native American burial ground, The Jury Room once operated as a bordello. Featured on “The Dead Files”, objects often move by themselves and a tall, shadowy figure occasionally appears behind the bar. Women also report being attacked by unseen forces. The Melting Pot, Littleton, CO: Formerly the town jail, both an inmate and a jailer are said to have died on the premises. Candles light themselves, machinery moves around and voices are often heard behind the sealed back staircase. Menger Bar, San Antonio, TX: Opened in 1859 and attached to “the most haunted hotel in Texas”, there are supposedly 32 known ghosts wandering the buildings. One is said to be Teddy Roosevelt. The Middleton Tavern, Annapolis, MD: Established in 1750 and a favorite among our Founding Fathers, a ghost of a Revolutionary War soldier has taken up residence at the Middleton. He topples tables, tosses dishes and turns the wall lamps upside down. One If By Land, Two If By Sea, New York, NY: A Parapsychologist has asserted that approximately 20 different ghosts haunt this famous romantic restaurant. Machinery mysteriously starts up, flatware floats and ghosts appear at tables. Aaron Burr is said to be one of the resident specters. Patrick’s Road House, Santa Monica, CA: This famous diner’s ghosts are from the building’s former incarnations as a motel, hot dog stand, brothel and trolley station. The most persistent of these specters is the former owner, Bill Fischler—employees have quit after encounters with his ghost. Poogan’s Porch, Charleston, SC: Considered by many as the most haunted spot in Charleston (some believe the most haunted in the entire world), Poogan’s is haunted by its former resident Zoe St. Armand, who is said to have gone mad after the death of her sister. Both patrons and employees have frequently seen her ghost. Restaurant 1833, Monterey, CA: Located in the former 200-year-old home of socialite Hattie Gregg, this restaurant is a James Beard nominee. Hattie is known to play tricks on diners, such as toppling their wine glasses. The Savoy Grill, Kansas City, MO: Located inside the oldest continuously operating hotel in the U.S. west of the Mississippi River, The Savoy is haunted by Betsy Ward, a hotel guest who died there in the 1880s. Guests and staff have reported strange voices and unexplained door-slamming. Slippery Noodle Inn, Indianapolis, IN: The oldest bar in Indiana, the Slippery Noodle was once a bordello and a stop on the Underground Railroad. People have heard whispering voices in the basement, seen strange shadows and felt cold unexplained cold spots and touches. Stone’s Public House, Ashland, ME: Professional paranormalists have confirmed spirits present in the upstairs rooms at this former hotel built in 1834. Doors won’t stay locked and lights often turn on and off by themselves. This entry was posted in General and tagged food industry, Halloween, restaurant. Bookmark the permalink. Follow any comments here with the RSS feed for this post. Both comments and trackbacks are currently closed.